Historical re-enactment is a broad church with enthusiasts ranging from those who seem to be indulging in little more than camping in fancy dress, through those who collect costumes, equipment, and even groups, to immersive “experimental archaeologists” for whom no detail should be ignored. It’s for others to decide where I and my printing press appears in the scheme of things. I’m well aware of several anachronisms in my presentation and rather than pretend they are not there, I’ll draw attention to them and let visitors know how it truly was – so far as I know ! Firstly, women didn’t work presses in the 17th century. 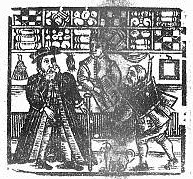 They did run printing businesses as can be seen in this interesting article http://library.missouri.edu/scriptamanent/2014/03/20/5-women-printers-and-booksellers-of-the-17th-century/ but according to Moxon, even the presence of a woman in the printing house was enough to attract a solace, or fine. Secondly, presses did not generally move about. There were supposed to be clandestine presses run by the Levellers in the later 1640s, but obviously no one knows what they looked like. In order to attain the speed of the “token” or 250 sheets in an hour, it is necessary to brace the press against the workshop ceiling. Temporary presses were set up during the famous London Frost Fairs in the 17th and 18th centuries, but my guess is that they would have not have been worked very hard. I was fascinated to learn that one of the first presses in England was run by the monks of St Albans Abbey in the late 15th century. This disappeared at the Reformation and from then, printing was only carried out in major centres where it could be controlled by the Crown eg London and Oxford University. This control broke down somewhat at the outbreak of the Civil War, but the explosion of publishing and news sheets in the Civil War still emanated from London for the most part. Having said that, there’s no denying that printed matter reached all corners of the nation and there was a well established system that made it possible. This was the network of petty chapmen who would buy stock from a merchant and then set off with a bundle of stock on a recognised route around smaller towns and villages; sometimes they had stands at markets. Booksellers could prosper but ballad sellers had a bad name, sometimes being viewed as little better than beggars. They would sing out the song that they were selling, thus enlivening the fair or hanging that they were at. A full and interesting study of the lives of the petty chapmen is “The Great Reclothing of Rural England” by Margaret Spufford.